Damian Lillard joined a select group when it was announced Thursday that he had been named to the all-NBA first team by a vote of the media. 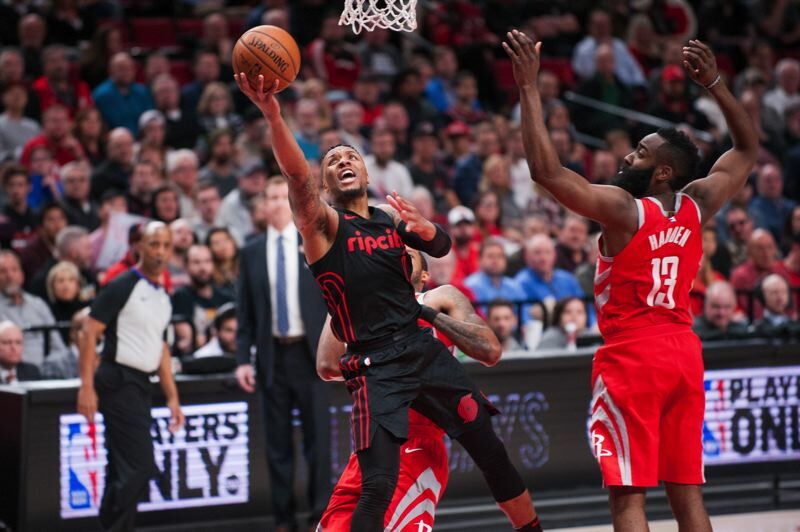 The Trail Blazers point guard becomes the third player in the franchise's 48-year history to make first-team all-NBA, following Bill Walton (1977-78) and Clyde Drexler (1991-92) in securing the honor. Others chosen for the first team were Cleveland's LeBron James, Golden State's Kevin Durant, New Orleans' Anthony Davis and Houston's James Harden. Members of the second team included former Blazer LaMarcus Aldridge, now with San Antonio, along with Toronto's DeMar DeRozan, Oklahoma City's Russell Westbrook, Philadelphia's Joel Embiid and Milwaukee's Giannis Antetokounmpo. Lillard, who turns 28 on July 15, was a third-team all-NBA selection in 2013-14 and made the all-NBA second team in 2015-16. The 6-3, 195-pound Oakland native averaged 26.9 points, 6.6 assists and 4.5 rebounds this season, finishing fourth in the league in scoring and third in free-throw percentage (.916). He became the third player in NBA history to record 1,500 points and 400 assists in each of his first six seasons, joining LeBron James and Oscar Robertson.